My latest Sassy Gardener column hits the streets today. You can read it online, but if you want to see the photos from my visit, you can see them here in Flickr. I have to say how fortunate I feel, to visit and write about such wonderful people like Rodger and Mark. I've "known" them from online for awhile, and have been such great resources to me in learning canning. They have always been so generous in sharing what they know, and visiting them in their garden, was no different. I left with more jam, and some apples, and just a really wonderful feeling of content. I hope the story reflects that. I think they're pretty fantastic people. 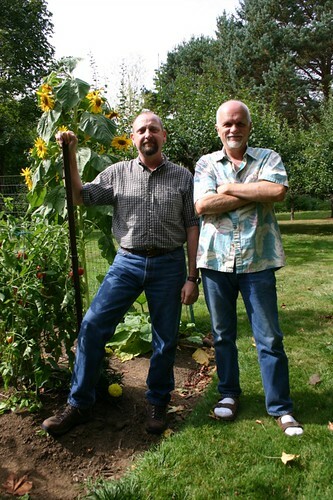 Thank you, Rodger and Mark, for sharing your garden with me. And now my readers, too, you lucky people. What a fun column, you make it sound like we know what we're doing! It was great having you visit and we'll have to plan a nice harvest lunch next summer before all the plants are pulled up. Thanks so much for the nod Lelo, and we're looking forward to more farmer's swaps with you soon.